Shhhh...we're going to pretend it's still Friday. Okay? Great. 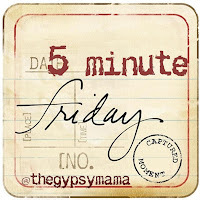 Click over to The Gypsy Mama for the rules and participate! We have a new member of our family. Meet Fish Food. So named by my very clever, three-year-old, Zoe. He was her birthday present and has been a very long awaited- at least in the eyes of a young child- family addition. I found myself getting more and more excited with her as she chose the fish from the big tank and made preparations to bring him home. Once we brought Fish Food to his new home, we had to prepare his new fishbowl. I had so much fun doing this with a very excited Zoe last night. I didn't realize how much work it is to create a safe environment for a fish. Seriously, what if I don't put in enough water purifier? Or I put in too much? What if we forget to feed him? Or if we leave him in a too hot or too cold area? How am I going to explain life and death in such a powerful way to my three-year-old? Let's just hope I can keep the dang thing alive and she won't have to learn such a hands-on lesson about life or death at her age. What a kind person you are to leave me a note!